Will McCain Sue Trump for Trying to Bring Back Torture? 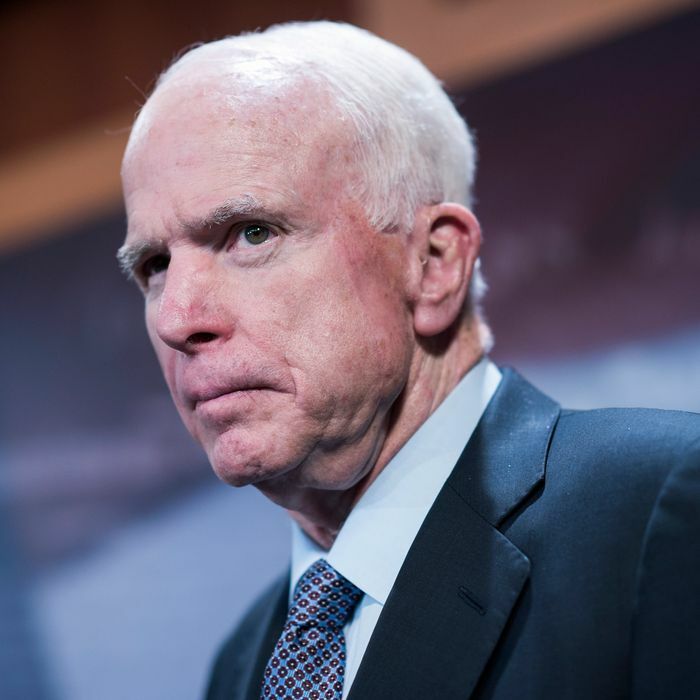 McCain is threatening to see the president in court if he defies a congressional ban on “enhanced interrogation” methods. People worried about Donald Trump’s respect for the law and the Constitution have often wondered if the president’s political party and the federal courts would restrain him if he crossed too many lines. Well, at least one Republican leader — the GOP’s 2008 presidential nominee, in fact —may soon haul Trump into court for violating the law. President Donald Trump is asking for a review of America’s methods for interrogating terror suspects and the possible reopening of CIA-run “black site” prisons outside the United States, according to a draft executive order obtained by The Associated Press. With respect to the CIA’s “black sites,” McCain noted that Trump’s choice for CIA director, Mike Pompeo, had publicly committed in confirmation hearings that the intelligence agency would comply with military standards for interrogations, which ban waterboarding and similar “enhanced” techniques.